Johann Heinrich ("John Henry") Gaumer was born on Oct. 4, 1754 in Macungie Township, Northampton County, PA, a son of Johann Dietrich and Maria "Elizabeth" (Meinert) Gaumer Sr. Evidence suggests he may have been a Revolutionary War veteran. He was baptized at four months of age, on Feb. 6, 1755. In 1775, at the age of 21, Johann Heinrich married 20-year-old Anna Margaretha Meitzler (1755-1830). The family lived in Macungie Township and produced eight known children – Catherine Fögle ("Fegely"), Susanna Fögle ("Fegely"), Heinrich "Henry" Gaumer, Anna Margaretha Wetzel, Johann Adam Gaumer, Jacob Gaumer, Elizabeth Gaumer and Salome Gaumer. 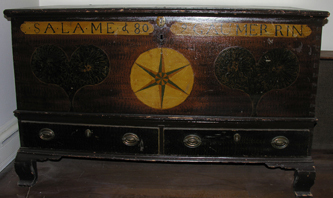 Wooden chest, dated 1809 and possibly made by Heinrich, inscribed with a daughter's name "Salame Gaumer rin." Johann Heinrich died in 1837, and his will was probated on Sept. 6 of that year. He is believed to be the same "Henry Gaumer," fomerly of Macungie Township, whose executors were Henry Gaumer and Adam Gaumer, advertised in the Allentown (PA) German language newspaper, Der Lecha Caunty Patriot (Dec. 19, 1838). The fates of Anna Margaretha and the younger children are unknown.